For those who have been looking forward to the Wrath of the Lich King and were wondering how the new Death Knight class would stack up against the others in the game, let me tell you now that this class does not disappoint. Let’s start with the character creation, where you choose all your looks and races before you ever enter the world. While this part is the same as others, you will find that the Death Knight comes with it’s own set of green armor before you even set foot in game. The armor looks like some evil, black monster armor that you’d see in some old knight movie, and is perfect for the story behind the class. Once you choose everything just how you like it, you then enter the world of the Death Knight. One thing that is completely different than any other race or class that you’ll play, is that in the beginning quests for the Death Knight, you will earn all epic items for quest rewards that will completely re-outfit your DK as you go, ending with a massive, horned helm that is truly wicked. You also gain your DK mount within the first 10 quests, which is awesome as well. You don’t have to pay a lick for your mount or any of your armor, you simply do the quests and they are your rewards. With these differences in the Death Knight class from all of the others, and the great starting out basics of the class overall, I give this area of the Death Knight class a monster 5 out of 5. Once again, Blizzard doesn’t disappoint here either. While the opening scene was a bit longer than I expected it to be, the graphics and the sounds are awesome. From the very beginning of your time as a Death Knight, it’s easy to tell that Blizzard put in some major time to create a beginning area for this class that was like no other. Here, you will ride skeletal gryphons up to your floating scourge home in the sky, you will ride massive dragons over the Scarlet Armies and defeat them, you will transform souls over to the will of the Lich King, and you will find great rewards while doing this. From the first touch down and those first few quests, it’s clear that the Death Knight will swiftly become one of the favorite classes in the game for many players. Overall, for the beginning scene and the graphics in the starting quest areas, I have to give it a big 5 out of 5. Once again, Blizzard will awe you here. It seems that all of the colors are more contrasted to me, from the pink, swirling portals to the glowing green eyes of the Lich King, everything seems brighter and bolder in this new starting zone. You will also notice that your Death Knight has better detailed armor, including evil barbs on their arms and shoulders from the get go. While some of the mobs that you’ll fight are the same look that you get in other areas of the game, nothing about this new class is even close to anything else that you’ve played in the other World of Warcraft expansions. The mount that the Death Knights gain as a reward is a massive, skeletal mount with frosty white feet, flowing eyes, awesome armor, and complete with ram horns at the top of it’s monstrous head. For the graphical part of this new class, it once again earns a solid 5 out of 5 from this WoW Head. No matter if you like the original World of Warcraft or not, the Death Knight is one sweet class. At the end of the DK’s quest line, you find out that the Lich King runs away to fight another day, and you are then turned against him. While you have to work your way through a major city being spit upon and having rotten fruit thrown at you after you have completely the Death Knight beginning training quests – you become friendly with the faction that you choose and you can then level your Death Knight as normal. So, after all is said and done, the new Death Knight class gets a solid 5 out of 5 from me and I recommend that you take the time to create on when you can. For those who want to see a complete walkthrough of the quest line that takes the Death Knight through from start to finish, you can find a free one here that will give you a complete list of all of the quests in order. 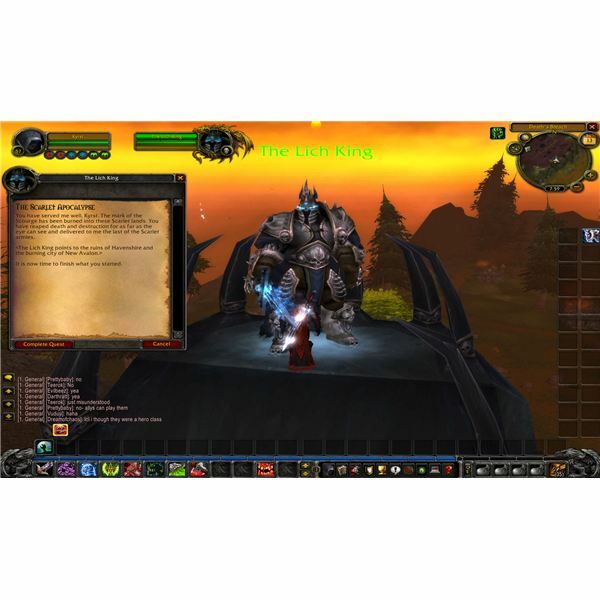 Want to play a Blood-spec Death Knight in World of Warcraft? This guide provides you with the info you need to know to get started.